Note from the editor: Here’s something a little special. The following was sent to me by my mother and I’m posting it under an account I’ve created in her name. We don’t always share much. While she wasn’t the type of parent to actually throw out a kid’s collection, she has had trouble understanding just what it is I take so seriously about my hobby. I was touched that she had a story to tell about her own experiences with comics and that she took the time to email it to me. She’s given me permission to share it here with you guys. 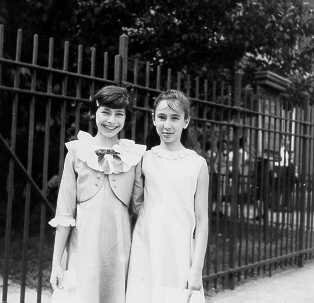 That’s her (on the left) and her friend Mara in 6th grade. 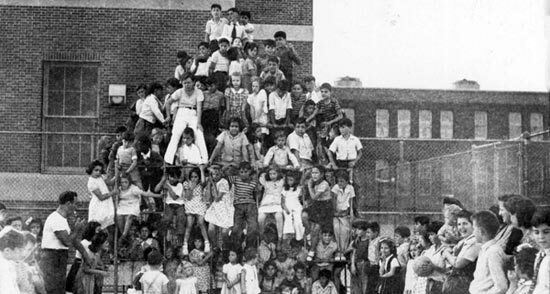 Move back in time to the period between 1961 and 1965, while we, young boomers, were in elementary school. 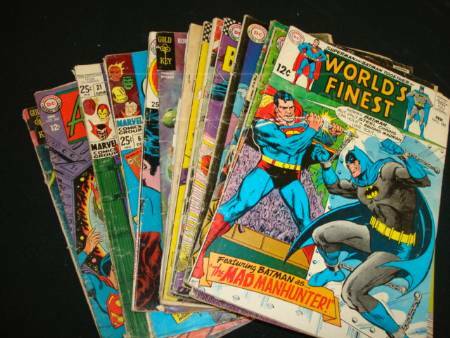 Then you could buy comics for 10 cents new, or 5 cents used, or win them by penny pitching. As the years flew by the prices rose to 15, 25, and eventually 35 cents. By then some of us moved on to fantasy and science fiction, and junior high, and passed on our collections. Jay and Mark were avid collectors, and I suppose readers, of comic books. Somehow I remember the collecting more than the reading. They had stacks of Marvel and DC comics. In our gang Superman, Superboy, Batman and Robin, and Spiderman were the ones that I most recall. But we also collected Wonderwoman, The Flash, any of the Legion of Superheros, the Fantastic Four, and issues of Archie and Ritchie Rich. I too had a few, but was not one for accumulating this kind of ‘stuff’. Boys seemed to be the ones with more ‘stuff’. The girls seemed to spend more time chatting and playing with each other rather than engaged with things. Although we did tend to collect Barbies and their clothes. I also spent a lot of time day dreaming. Along with my friends I did read comics, especially the Superman series where Lois Lane and Lana Lang were featured. I was fascinated by these female archetypes, their clothes and demeanor. Wonder Woman seemed cool, but was intimidating in her buxomness. I and my girlfriends also seemed to gravitate to the Archie series. Cute characters, humor, a peek into a fantastic world of teens and relationships, as opposed to a focus on action, fighting, and the dark villains of some comic series. Winter and nasty weather days we’d gather in each other’s apartments with our ‘stashes’ to read and trade amongst ourselves. Jay, Stu, Mark, Sheryl, Steven. Maybe Karen, Penny, Judy, and Risa. Any one that lived in our section of the buildings on Gale Place, the Amalgamated, the Bronx, or were connected to it via a basement labyrinth. Mostly we hung out at Jay’s. Spring and summer were special times where we grabbed our stacks and headed to the Big Playground. It was easy to get to as the sidewalks were continuous from the front entrance of our building, 130 Gale Place, L-shaping along Van Cortland Park to the playground set up on a hill. It was on this hill that a lot of action took place. Kids came out with suitcases of comics, some in series wrapped in rubber bands. Some were lugged in little red wagons. We laid out the stacks in displays usually 4 or maybe 5 rows high, and a few wide. Mark loved to command a post atop of the displays and hawk the opportunity to win a special edition or collection with the pitching of a quarter or two. For the most, comics could be had for a penny landed on the smooth and often shiny surface of the cover. A few comics stacked together could command a nickle. As they were slanted on the rise, getting a penny, nickel, or quarter to stick on top of the stack did require both skill and luck. Aim true and you had a chance, but often the change could easily glide off the edges onto the grass. Scooped up by the hawker, the change would add up over the course of a few hours or a day. This could be saved for ice cream money or a chance to pitch for a competitor’s collection. Stevie had an admirable technique. He used to spit on the penny to ensure it would not slide off! Those selling would arrange the difficulty according to whether they really wanted to part with their prize collections or how seriously they were bent on ‘earning a few’ . They would draw the pitching line close or far depending on age and size. Little kids were always allowed to be closer to even up the competition. Girls also were at times given this advantage, though some of us prided ourselves on our aim and throw, and wanted to play evenly with the guys. If the set up was too easy, the game was no fun , and there was no pride in winning. We girls got to hawk our wares too, or even ‘man’ the collection for our comrades. We’d all save pennies over the course of the year for these occasions. I never figured out how word got around to know when there would be penny pitching contests. Maybe it was partly the weather, a weekend, and a few kids together deciding to head out to the Playground with their stacks. Others seeing them probably made impromptu decisions to go get theirs, find their stashes of coins, and come back out to play. It was like a mini-festival, a kid-version arcade on a much simpler but more satisfying scale. It was community, and of course budding consumerism and learning a bit about business and sales. Fast forward – Mark is a lawyer, Jay’s a millionaire. I’m no Veronica, but we’ve managed to stay connected. And what happened to the comics? Jay tells me his grandfather handed them out to the kids in Harlem from his butcher shop. On one of these same Bronx playgrounds. Enjoy your family time everyone! No idea, but we all used to be pretty into em as little kids. Probably just because grandpa always gave them out. 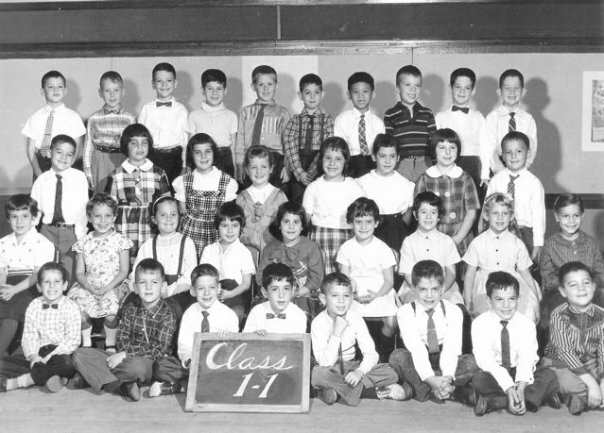 Stuie’s 4th from right in top row of first grade pic, and I’m 4th from right in 2nd row! Oh my. 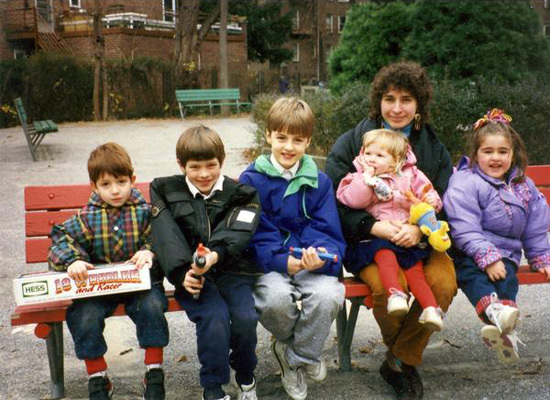 My parents grew up in Brooklyn, so I wonder if they did the same thing in that borough. I’ll have to ask them later today. Wouldn’t that be something, now that their grown son is into collecting comics. LOL. My mother got rid of my early comics, unfortunately. Anyway, thanks a bunch for allowing Ian to share that essay with the rest of us. Very kind of you. I know this is an older post, but WOW, this was a great read. Thank you so much for posting it and please tell your mom thank you for writing it. It’s amazing how little we may know about the events that our parents were involved in before we were born. Funny how they parallel what we have gone through with little (or sometimes major) twists to them. Will we be telling our children about collecting garbage pail kids cards or pogs? while i was in the fifth grade taking a long bus ride to a psychologist at the jewish board of guardians, i used to read ec horror comments and get scared, fascinated and rebelled all at the same time. much later in 1966, according to the love of my life, barbara j, i made a comic strip portraying her as a crazy woman. I am in the Class 1-1 photo! Second row down from top third one in on left…Leslie Auerbach.